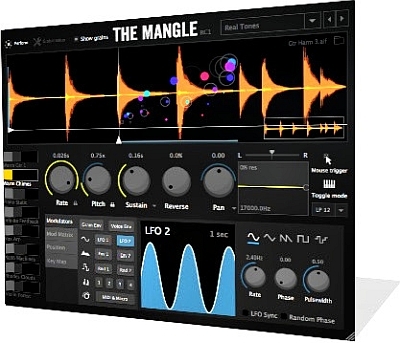 The Mangle grew out of many years of experiments with granular synthesis. The goal was to "play" with the flow of granules in a musical and expressive manner. This has led to some unique features: a large XY-zone with the display of granules in real time. Lock the pitch and tempo. A true stereo of granules and multi-timbried layering. Stretch the rich harmonics of acoustic sounds. Turn records into the surrounding soundscapes. Or get synthetic sounds that will be crushed, blown up and recombined with complex patterns and effects.